We offer a 1 to 1.25 hour program on various topics related to the paranormal. So far we have presented over 50 programs to dozens of public libraries, museums, park districts, and historical societies. Scroll down to see the complete list of locations we have presented at. The primary goal of these programs is to educate the public on the paranormal and what the paranormal is not. These programs are provided free of charge, but we will accept donations if offered. In 2014 and 2015, we will be conducting these programs on Thursday and Friday nights at 7PM or Saturday afternoons at 1PM. Please note the October dates will fill up first and fast. We offer two courses on Paranormal Investigations that go over how to conduct a paranormal investigation from start to finish. Each course is 4 weeks in length and ends with an actual investigation of a location. This is a fee based program. We offer an "Investigate with TnT Paranormal" event where we partner with a location to allow the public to investigate the location with a paranormal team. Pricing varies based on the location and what services are desired. NOTE: This is not a client based investigation; go to the Contact Us page to make that type of request. We offer assistance to historic locations to help them with clean-up efforts. There is no fee associated with this effort. We have worked several Meet and Greets to educate the public about the paranormal and our team. There is no fee associated with this effort. All we ask is to be able to advertise and promote our team at the event. We offer a 45 minute to 1 hour long program on various topics related to the paranormal. The fee for these presentations will vary based on the event, topic, location of the conference/event, travel requirements, other requirements, etc. To you have an event in mind and it's not listed here...no worries. We are willing to discuss it with you. If you wish to schedule an event with us go to the Event Request Form. NOTE: We will be accepting food donations that will go to support local food pantries. Donations appreciated! TnT Paranormal hosted at the 2017 Black Market a Dark Art Experience Event. Event took place on 9/21 at 8747 International Dr, Orlando, FL. Our founder, Melissa Tanner, has lectured on various paranormal topics at over 150 different events. If you are interested in booking an event with us please email us. Description: Have you ever wondered if there is life after death? Do you watch the paranormal shows on TV? Have you ever wondered if what you see on the shows really happens? Then join Melissa Tanner, and other members of TnT Paranormal Investigators LLC, to find out the answers to these questions and many more. In this course we will cover various paranormal related topics such as: the history of the paranormal field, the types of paranormal, the types of hauntings, investigation basics, debunking tips, the different equipment that is used for an investigation, and some of the common issues found with the equipment. There will also be a hands-on workshop with some of the equipment used by TnT Paranormal during their investigations. So if you want to learn more about the paranormal and/or the approach and technology behind a paranormal investigation then this is the class for you! Cost: There will be a fee associated with this course. Details to follow. Description: Do you want to learn more about the field of paranormal investigation? Would you like to learn about some of the theories, tools, and techniques behind a paranormal investigation? Would you like to go on a paranormal investigation? Then join Melissa Tanner, and other members of TnT Paranormal Investigators LLC, to find out the answers to these questions and many more. This class is a follow-up of the Paranormal Investigation 101. Paranormal Investigation 102 will take a closer look at the field of paranormal investigation including: conducting research, photography dos and don’ts, how to conduct a client investigation, how to approach data review, and tips for forming your own team. In the class we will discuss how to approach a paranormal investigation from start to finish. At the end of the class we will conduct an actual paranormal investigation! So if you want to learn more about the paranormal and/or the approach and technology behind a paranormal investigation then this is the class for you! DVR / Camera Setup - An area was setup to simulate what the DVR system and IR cameras looking like during an investigation. Digital Equipment - An area was setup to conduct mock EVP sessions. EMF Detectors - An area was setup to show how to perform an EMF sweep of a location. The event was hosted by WCP. Midway Village, Rockford, IL / May 10, 2014 (with Haunted Rockford, Paranormal Investigators of Milwaukee, and Ghost Research Society). Arlington Heights Historical Museum, Arlington Heights, IL / Oct 22, 2016, Oct 24, 2015, Apr 11, 2015, Oct 25, 2014, and Aug 2, 2014. On March 28, 2015, our founder, Melissa Tanner, will be speaking on the topic of Provoking vs Use of Trigger Objects. To Purchase Tickets. Paranormal Unity @ the "R"
On January 31, 2015, our founder, Melissa Tanner, presented on the topic of Provoking vs Use of Trigger Objects. On June 6, 2015, our founder, Melissa Tanner, will be speaking on the topic of Provoking vs Use of Trigger Objects. This event is FREE! To learn more click here. In November 2014 and October 2015, we hosted an EVP Listening Gallery with each station focusing on a different IL location. On September 25 and 26th, 2015, our founder, Melissa Tanner, spoke on the topic of Provoking vs Use of Trigger Objects. We hosted a booth at the Chicago Ghost Conference III (2011) at the Portage Theater in Chicago. 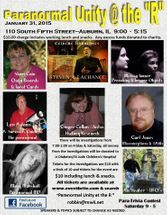 This event was hosted by Ursula Bielski and Chicago Hauntings. Featured speakers included: Jeff Belanger, Chris Fleming, Dave Schrader, and Michael Kleen. On October 4, 2014, our founder, Melissa Tanner, presented at the IL Paranormal Conference on the topic of Legend Tripping in IL. Other featured speakers include: Rosemary Ellen Guiley, Paul Smith, and GRAGG. On September 28, 2013, our founder, Melissa Tanner, sat on a paranormal panel with others that included: Mark Schwabe from GHS, Dale Kaczmarek from GRS, Author Michael Kleen, Noah Leigh from PIM, and Psychic Paul Smith. On September 22, 2012, our founder, Melissa Tanner, presented at the IL Paranormal Conference on the topic of Provoking vs Trigger Objects. 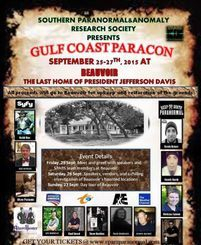 Other featured speakers include: Ghost Head Soap, Dale Kaczmarek, and Ghost Gadget Guy.